Many life history strategies seem to be highly evolutionarily labile, evolving independently multiple times across a phylogeny. Dormancy seems to fit this bill, appearing to evolve rapidly within closely related clades. Our transcriptomic studies also support this view, showing that at the level of transcription, regulation of dormancy is surprisingly non-conserved in invertebrates, though different species seem to converge on a few similar physiological phenotypes. As we continue to accumulate transcriptomic data, we are further characterizing these metabolic and regulatory similarities to ask 1) is there any core cassette of pathways that are always associated with insect diapause, and 2) are pathways critical to diapause coopted from other highly conserved pathways such as stress responses. Clustering diagram based on the transcriptome-wide diapause response, and heat map of a subset of genes for insect representatives. Clustering illustrates widely divergent responses among insects, so much so that Drosophila diapause clusters no closer to other fly species than worm dormancy (C. elegans dauer stage). Yet, expression patterns illustrate that there are some clear commonalities in insects, particularly in genes linked to developmental arrest. In Rhagoletis pomonella, we are attempting to understand adaptive changes in pupal diapause regulation over much shorter evolutionary distances. Diapause development proceeds through multiple phases, separated by important transitions. In Rhagoletis diapause we have pinpointed these phases through metabolic and developmental phenotyping, and have thoroughly characterized the process of diapause termination at the transcriptomic level. 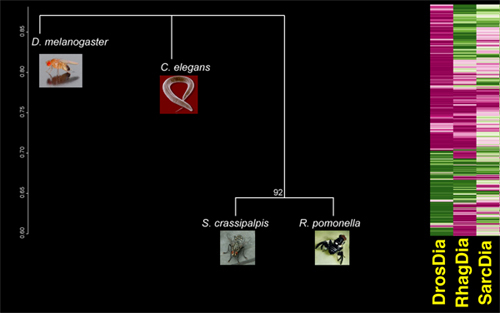 Phases of pupal diapause mapped onto a metabolic rate trajectory and physical developmental markers in Rhagoletis pomonella. 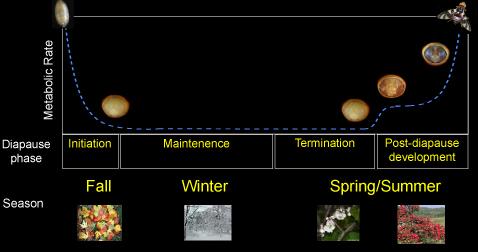 Rapidly host shifting from native hawthorns to earlier-fruiting apples has imposed strong selection on life history timing, and we are now employing RNAseq in tandem with our phenotyping methods to identify the precise, developmental targets of selection and their physiological control. These studies are complemented by genomic screens for variants that underlie adaptive differentiation.